An unknown type of shark was recently collected at the Natural Energy Laboratory of Hawaii, the same lab that captured a creature known as the "octosquid." 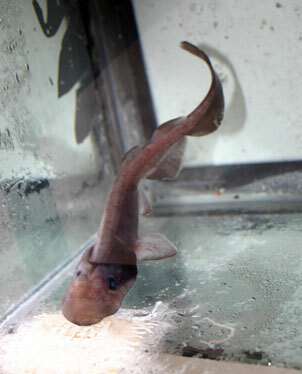 The creature, dubbed the "microshark," might be one of only three known specimens of a deep-water catshark. A Big Isle lab nabs its second rare specimen in the "microshark"
A small sharklike creature with a flat head and green eyes is the latest denizen of the deep sucked up to the surface at the Natural Energy Laboratory of Hawaii on the Big Island. The newest creature was dubbed a "microshark" by Jan War, operations manager at the natural energy lab. Scientists tentatively identified it as a deep-water catshark and said only two other specimens are known to exist. Christopher Kelley, a biologist at the Hawaii Undersea Research Laboratory, said it could also be a new species. "This is a very exciting catch," he said in an e-mail. It is the second rare creature brought up alive by the lab, which operates pipelines that bring up cold sea water from 3,000 feet below the ocean surface. In July a creature dubbed an "octosquid" was brought up alive, but it turned out to be an old species of squid and not a creature that was half squid and half octopus. It eventually died and is being studied at the University of Hawaii at Manoa and Ohio State University. War said the deep-water catshark was found in the pump area and is about 9 inches long with a partially translucent body "with slits close to its mouth that look like a skate or ray." It was still alive as of Friday and swims like a shark, he said. The lab is working with students from the West Hawaii Explorations Academy charter school to set up a program to monitor the filters at the lab for other new sea creatures. "There's a lot of things down there we don't know about," War said.